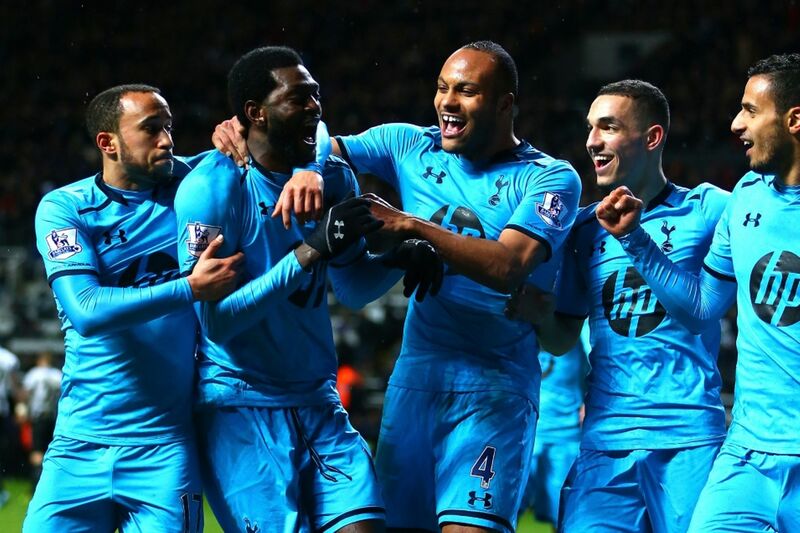 Tottenham Hotspur put in their best performance of the season against Newcastle United on Wednesday night. The 4-0 win was preceded by another vital victory over Everton last weekend. Despite the 1-0 scoreline, Spurs were poor against the Toffees. So how did Tim Sherwood tactically inspire his Tottenham side to thump the Magpies? Starting with Everton, Spurs started slowly against a well drilled, organised team managed by Roberto Martinez. Prior to the game, Sherwood accentuated the importance of winning individual battles. His side lost them all over the pitch for the first 20 minutes or so. The familiar absence of a defensive midfielder was again evident. Leon Osman, playing centrally in an attacking midfield trio, often found room to trouble the home defence; he could have had a first half hat-trick. It remains unclear what exactly Sherwood is instructing his deeper-lying central midfielders to do. Both Moussa Dembele and Nabil Bentaleb seem willing to dictate the pace from deep, yet struggle to sit when on the back foot. Despite these shortcomings, Dembele influenced the game heavily through the middle. His footwork was mesmerising at times, but the Belgian lacks vision, rarely even attempting a through-ball or incisive pass. He does, however, get the crowd excited, primarily by dropping a shoulder and drifting past opposition players with inexplicable ease. 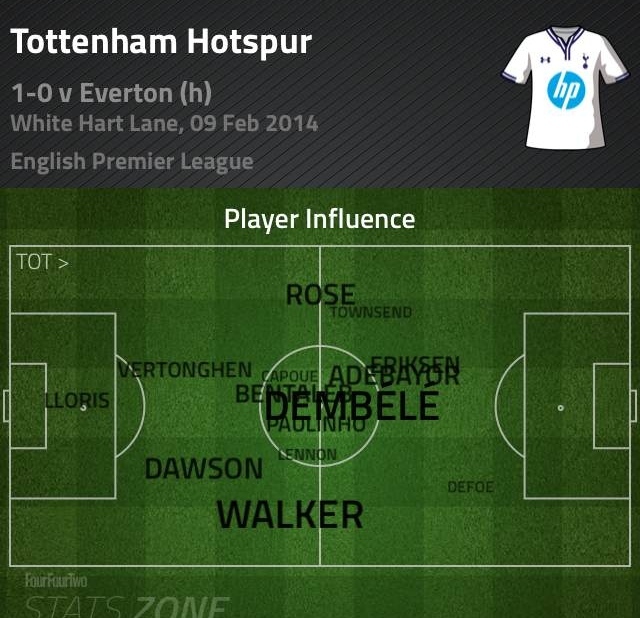 The player influence graphic also emphasises Aaron Lennon’s poor performance. Spurs relied on Kyle Walker to provide an attacking threat down the right. Lennon was simply a passenger. In fact, right-back Walker was likely Spurs’ top performer – a sentence featured in more than a few articles this season. He let himself down with his crossing, but that’s nothing new. Delivering the ball into the box is something he must work on. One of Walker’s most admirable traits is his fearlessness. His sporadic misdemeanors are an unfortunate result of his willingness to regularly attempt something a bit different. The quickly taken, chipped free-kick that assisted Emmanuel Adebayor’s goal was a delightful piece of quick thinking from the Tottenham full-back. The goalscorer’s contribution wasn’t bad either. Adebayor’s strength and composure encapsulated what Spurs were missing before the Togolese strikers’ return to the team two months ago – a player who can change a game with one moment of brilliance. His finish was sublime. It separated two teams fighting for an identical position in the league table. Everton outplayed Spurs, but had no final product. The absence of Romelu Lukaku – or any other recognised centre forward – aided Sherwood’s side immensely. Michael Dawson and the returning Jan Vertonghen were only put under pressure when the Toffees got in behind a midfield with no dedicated holding player. Eventually, Bentaleb and Dembele settled into the game and realised the need to help out the defence. 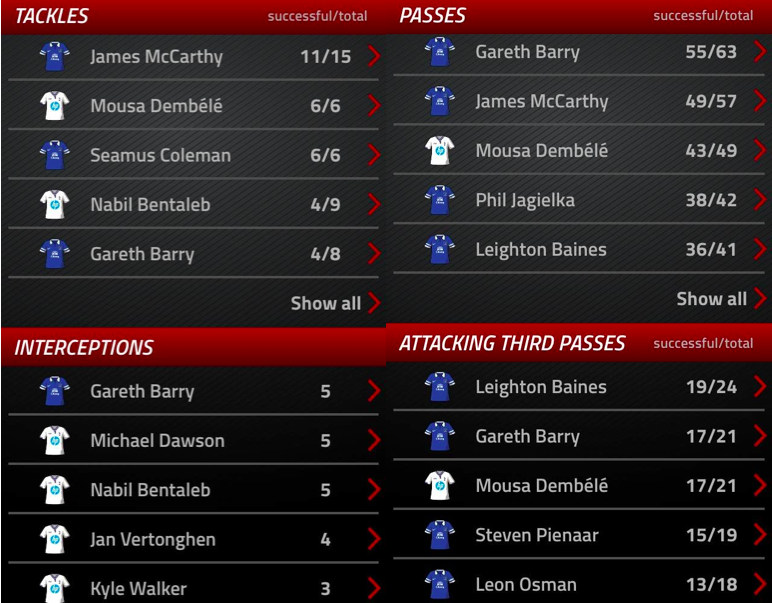 Dembele was his side’s top tackler, while Bentaleb matched skipper Dawson in terms of interceptions. It took a fine first-half save by Hugo Lloris to prevent a powerful Leon Osman effort from finding the net. The Frenchman continued that form at St. James’ Park three days later. Sherwood made multiple changes for the Newcastle game. Kyle Naughton replaced the injured Danny Rose and faired surprisingly well. Younes Kaboul finally returned to the first eleven and played brilliantly alongside Jan Vertonghen. If both remain fit, Kaboul and Vertonghen would be ideal as Spurs’ primary central defensive partnership for the remainder of the season. Lloris made three noteable saves that were every bit as important as the goals up the other end. The Frenchman’s shot-stopping ability was matched by his familiar ‘sweeper-keeper’ attributes and qualities. Only Newcastle goalkeeper Tim Krul has swept up behind his defence more times than Lloris this season. Etienne Capoue made a rare start, but his selection was eventually rewarded. Presumably, the idea was for Capoue to sit so that Dembele, Benteleb and Paulinho had less defensive responsibility. It didn’t appear that way early on, though. Newcastle found space in between the Tottenham midfield and back four on multiple occasions during the opening stages of the game. Capoue eventually found his discipline to fantastic effect. He was subtly vital, making a total of nine interceptions – only Michael Carrick’s 11 against Crystal Palace tops that tally in a single Premier League game this season. The plan worked. Bentaleb kept Spurs ticking, and played a crucial part in the opening goal. Paulinho was allowed to roam in attacking areas around Adebayor, and managed to tap in a rebound for the second goal. Dembele was utilised in unfamiliar wide roles, switching with Aaron Lennon throughout the game. Both Dembele and Lennon played well, calm in possession on the counter, taking advantage of clever runs from Paulinho and Adebayor. The pressure was off at 2-0. Sherwood smelt blood; Chadli and Townsend arrived to cause havoc with Newcastle committing most of their players to attacking areas. It was a brave, confident performance in which no individual let the team down. Spurs scored four goals for the first time in the league this term. 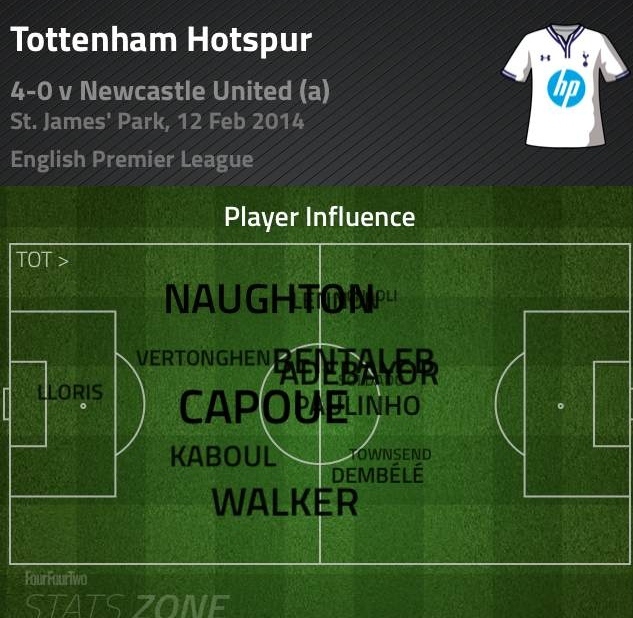 Capoue’s influence allowed Tottenham’s array of forward-thinking talent to attack with freedom. Against Everton, Spurs upped their game immediately after Adebayor’s goal. The very same thing happened at Newcastle, but much earlier. Tottenham are yet to lose a league match this season when they have taken the lead. At 0-0, the team appears anxious, especially at White Hart Lane. This is obviously a worry, but it is worry that can be countered by the freedom a reactive, defensive midfielder gives to the more proactive players among the Spurs ranks. Consequently, it will be fascinating to see if Sherwood persists with a dedicated holding player in future fixtures. Will it be too difficult to ignore Sandro when the Brazilian returns from injury, let alone the improving Capoue? It must be remembered that Bentaleb and Dembele did eventually provide key defensive contributions when needed in the Everton match. Bentaleb, particularly, is justifying Sherwood’s faith in him. With Capoue behind him, the 19-year-old flourished all the more. 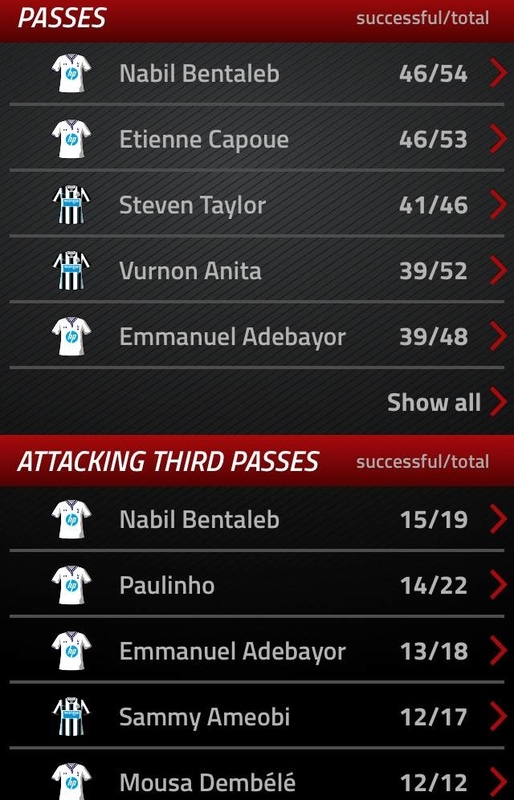 As well as being the game’s most successful passer, Bentaleb assisted Capoue with eight ball recoveries – only Capoue himself recovered the ball more times. Pundits and papers singled out Adebayor as the side’s top performer, deservedly so. Sherwood and the Spurs faithful will be pleased that Tottenham’s no.10 wasn’t singled out simply because he was the match’s only contributor, but rather because he was the best of a set of players finally finding their way. Newcastle were uninspiring to say the least, but Spurs’ head coach must receive credit for not resting on his laurels after the narrow win over Everton. Tactical changes needed to be made and they were. And hence, fourth place is not out of sight.